Picture credits: Virginie Lecaudey / EMBL. This image may bring to mind a patchwork quilt, or a picture taken from a gallery of abstract paintings, but the artisan behind it is actually Mother Nature, with a little help from scientists at the European Molecular Biology Laboratory (EMBL) in Heidelberg, Germany. Using an electron microscope, Virginie Lecaudey in Darren Gilmour’s group at EMBL captured this snapshot of the beginnings of an organ which plays a central role in how zebrafish perceive the world around them - the lateral line. Named after its position on the flanks of adult fish, the lateral line is a series of sensory organs through which most fish detect vibrations in the water, helping them to detect predators or prey, for example. As a zebrafish embryo develops, the cells that will form its lateral line have to become pointed at one end and arrange themselves around a central, unchanged cell, like cloves in a bulb of garlic, forming a rosette. This microscopy image shows one such rosette, magnified approximately 10 000 times. 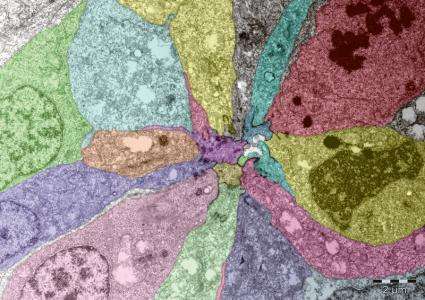 The image is false-coloured to highlight the individual cells.